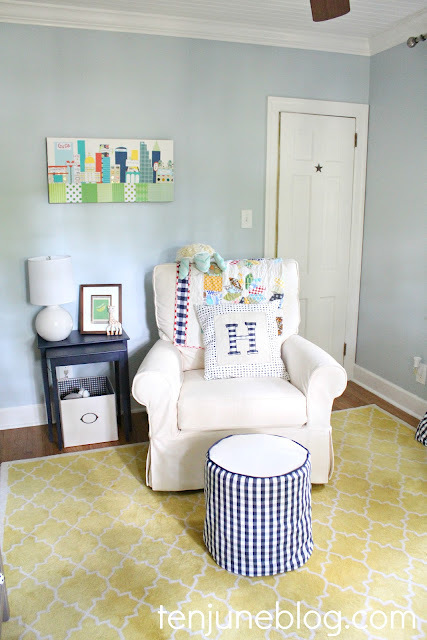 Well, one of the obvious things to ask a design blogger when she tells you that she finds out she's having a baby girl after thinking she's having a boy for five months is... what about the nursery?!! 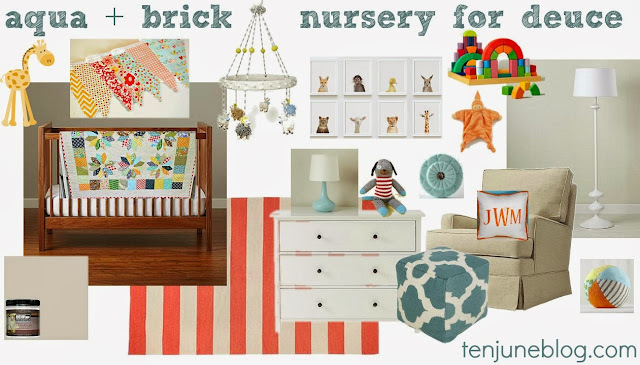 If you remember from this post, I had decided on a turquoise + brick red nursery for baby number two, when she was a he. As of last week, a few things had changed as the nursery was evolving, but the basics were the same as the mood board above. We purchased this crib from... of all places, Walmart! I did a lot of research before buying this crib. We wanted the crib to be a) solid wood, b) inexpensive, c) modern, clean lines and d) dark wood. I would have preferred something more honey oak colored like in the mood board, but the Walmart crib was amazingly fit all of the other criteria that I was totally fine with its espresso color. While this crib would have been perfectly adorable in baby girl's room, I felt like it was a little too masculine compared to HDawg's sweet white crib. So, last weekend, we switched the two! It has actually worked out perfectly... HDawg's new crib also came with a toddler rail and is lower to the ground, so it will be perfect once we decide to "de-crib" him. And the white crib, which you can read more about here, will be perfect for our little baby girl! My friends at Wayfair were generous enough to gift David and I with a changing table/dresser. 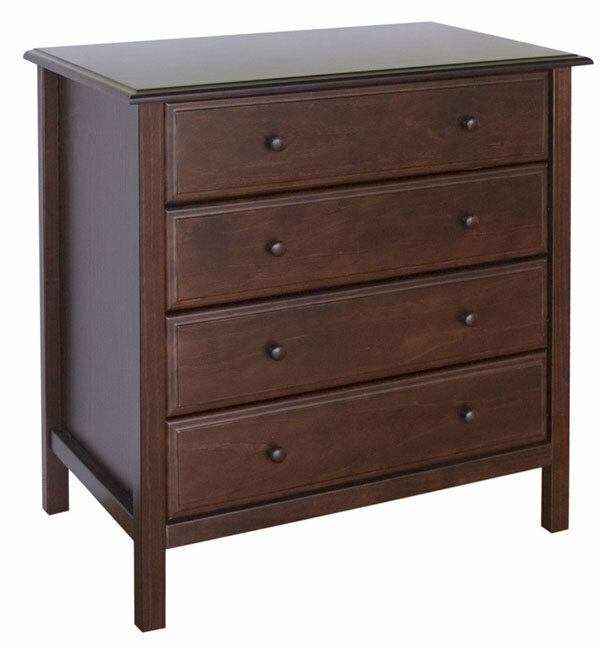 We chose this beautiful, modern wooden dresser. I think it will be adorable mismatched with the white crib. And, thanks to some really fun ideas from my sweet design-loving friend (hi, M! ), I have some ideas for additional updates I plan to make to the dresser. Should be fun! After the big debate in this post, we have finally decided to put HDawg's glider in the new baby's nursery. My mom has an old school white rocking chair that she's going to pass down to us to use in H's room as we phase him out of the rocking thing. While the walls haven't actually been painted yet, we do have a very, very pale light blue paint color ready for the walls. Like, the cans are stacked in the nursery, ready to be cracked open. To tell you the truth, I think we're going to keep that color for baby girl. It should work well with what I've got planned for the room! More on that below. I purchased this rug from RugsUsa about a week before we found out about baby girl. Luckily, the red striped rug hadn't shipped and I was able to cancel the order. I've got plans to order a new rug for baby girl and, yes, they include pink. Okay, so speaking of pink, let's talk about what my new plans are for the room! 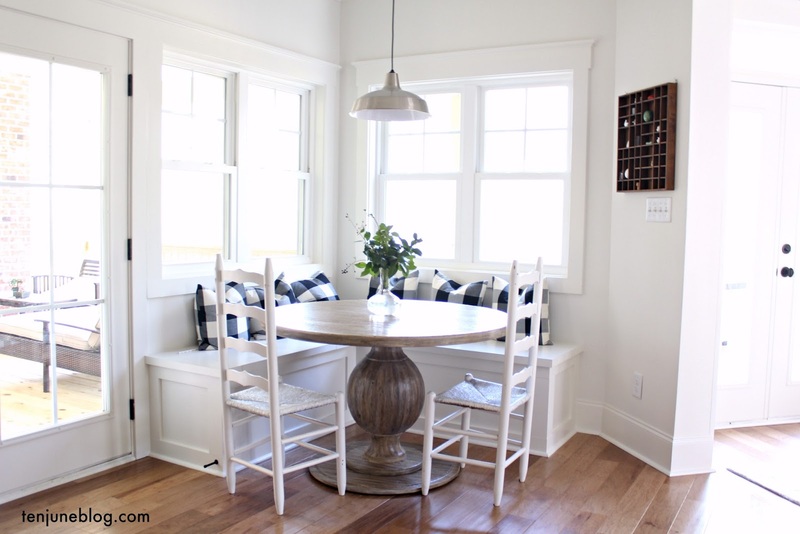 As I mentioned, we're going to use the light blue wall color, white crib, dark espresso dresser and off-white glider. The rest of the room? Pink and gold, baby. All girl! Kind of like this. Pretty, right? I can't wait to share everything with you as it comes together. Wait, let me start by saying I can't wait for all of this to come together, ha. I only have a few more weeks! If you've got any adorable pink or gold nursery suggestions, send 'em my way! I love the pink and gold combo! I can't imagine having to make all these changes at the very end! I'm impressed how you handled this surprise! I can't wait to see the progress and finished nursery..so exciting!!!!! We bought that exact same crib for Tagg but in the white. Two years later I STILL LOVE IT! I can't say enough good things about the quality and the style. And it made it through the move without a hitch. I love it so much more than Wells' expensive name brand crib. I'll be sad to see this sleek bad boy go when he needs real bed. I can totally understand changing up your design to help shift your mind from what you expected then to what you expected now. But the previous mood board didn't scream "MALE BABIES ONLY" - you could've kept it mostly the same. The new scheme is pretty, too, of course. Congrats!! I love the idea of pinks and golds... adorable and very chic! I can't wait to see what you come up with! I love that crib. I like the modern, straight lines and espresso. How fun! We are expecting a girl in May (at least we think it is a girl!) and are going with an aqua and coral color scheme. I am sure your nursery will be lovely when I all comes together! loving all the styles and colors! Team pink & gold over here!! I adore your plans & can I just say a) you're a flippin' adorable preggo b) thanks for embracing pink for your Baby Girl TenJune. Some mamas are adamant against it, why? It's one of the best things about little gals!! Can't wait to see more! !